Price Management software lets you confidently answer that most common question in a sales transaction: how much does it cost? It doesn’t matter what you are selling – nails or aircraft carriers. At some point, the prospect is going to ask the price question. It may be early or late in the cycle; it may be a formal request or a casual inquiry. Regardless, the question will come. There are only two possible answers to the question: the right answer or the wrong answer. Pricing professionals will undoubtedly say, wait a minute; there’s more to it than that. What about demand? What about the competition? The answer is yes, those things matter, but they are also largely meaningless if you are not first hitting the three bullet points. Further, our discussion is not about fixing prices, it’s about the management of pricing. That is where price management software comes into play. The fact is, when we talk about managing a product price, we are typically not managing a single price but rather a family of prices whose use is driven by conditions present during the sale. Further, price management encompasses the dynamic nature of prices, meaning the periodic maintenance of prices and how increases and reductions are managed. Sales campaigns and periodic pricing adjustments are managed from a central admin function. The availability and access to pricing is also controlled centrally. The admin manages prices for all products across all markets. Discounting seems to be the go to strategy for some sales folks. In the retail world, this seems to be especially true. I live in Cincinnati, and the same furniture freight sales outlet has been screaming its discount message from my TV on Saturday mornings for 30 years. Discounts can be based on many factors. Common discounts include volume discounting that reduces the unit price of the product for larger quantities purchased at the same time. National Account discounts are customised to reflect some anticipated business volume over several years by a single customer. Country pricing is simply the application of assorted discount factors to bring the local price for a given product into line with the prevailing currency position against the dollar or whatever home currency might be used. The key to the effective use of discounts is to make sure the transaction meets the necessary conditions associated with their use. Price management software working with CPQ can accomplish this. The customer status as far as national account qualification is established in the interview process early on. The quantities of product quoted are also entered, and those quantities drive the actual number quoted for the deal. The same is true with country. Price management software will maintain pricing lists for virtually each country that does business with your enterprise. Some markets just see things differently. They expect prices to be quoted in accordance with their view of the world. For instance, carpet is priced by the square yard. It could be priced by the pound or by thickness and content, but to folks buying carpet, square yards represent a metric that makes sense. Oil is priced by the barrel, coal by the ton and other commodities by all manner of metrics. In some cases, the buyer requires special pricing definitions. Hospitals purchase many different goods and services that are priced by the size of the institution measured by beds. School systems may purchase certain items by the number of students served within the system. In the software business, it was once common to price products based on the relative power of the host computer expressed in MIPS (millions of instructions per second). Price management software uses the correct pricing model for each prospect type. Again, with the help of CPQ, the prospect profile or data gathered during the interview will ensure that the correct metric is used for the type of prospect served. 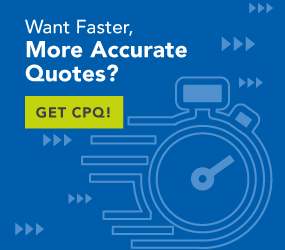 The beauty of linking CPQ and price management software together is the ability to maintain a complex pricing system that is instantly available for the individual customer or prospect. The prospect is assured of getting the correct price, and the company is assured that the price quoted is in accordance with their needs and strategy.